Latinos have lower mortality rates (a measure of the likelihood of dying) than whites. In 1996, the age-adjusted mortality rate for Hispanic men was 501 and for Hispanic women, 270. Comparable rates for non-Hispanic white men and women were 603 and 366, respectively. Among the elderly, Mexicans, Puerto Ricans, Cubans and “all other Hispanics” have lower mortality rates than whites. But Hispanics’ lower mortality does not apply to all age groups. Among persons aged 25 to 44, all Hispanic origin groups have higher mortality rates than whites. Another key indicator of well-being, infant mortality, tells a similar story. Hispanic infant mortality has dropped since the early 1980s and, on average, is below the rate for whites. 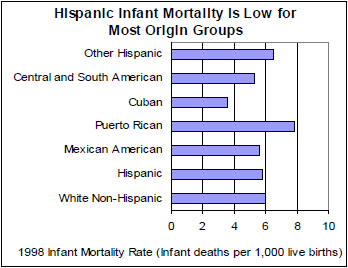 However, some Latino origin groups have infant mortality rates that are greater than the rate for whites (see graph). Latinos lower their mortality rate by avoiding some behaviors tied to chronic diseases, but they do not do as well with other risk factors. Latinos smoke less than whites. During 1994 and 1995, the age-adjusted percent of adults who currently smoke were 18 and 26 for Hispanics and whites, respectively. Between 1987 and 1992, Hispanics reduced fat and cholesterol intake more than whites. However, food insufficiency, another important health risk factor, is more problematic for some Latinos. Mexican American families report not having sufficient food to eat sometimes or often at rates much higher than white families. The higher Mexican rate of food insufficiency remains after controlling for poverty status. At the same time, obesity is more prevalent among Hispanics than whites, mostly among women. About one-fifth of white women are obese, compared with a third of Mexican women. Puerto Ricans also suffer higher health risks due to high rates of obesity. In regard to alcohol consumption, Hispanics are less likely than non-Hispanics to report excessive alcohol intake. Among adolescents, however, heavy drinking may be as problematic among Latinos as whites. In 2000, among 12th graders, 35 percent of whites reported heavy drinking in comparison with 31 percent of Hispanics. With respect to certain illnesses, Latinos have significantly higher rates than whites. Hispanics are nearly twice as likely to develop diabetes as non-Hispanic whites (5.7 per 1,000 compared with 3.0 per 1,000). Latino rates for certain infectious disease, including tuberculosis and AIDS, are also greater than those for whites. In 1998, the rate of new tuberculosis cases among all Latinos was 13.6 per 100,000, compared with 2.3 for whites and 6.8 for the U.S. population as a whole. Of all major racial/ethnic groups, Latinos have the lowest rates of health insurance coverage. Access to health care is strongly influenced by the options available. Hispanics often work for employers who do not provide coverage. At the same time, disparities are not as large among the elderly because of Medicare’s wide coverage. In 2000, 34 percent of Hispanics under the age of 65 lacked any type of health insurance coverage, compared with 11 percent of non-Hispanic whites. Lack of health insurance varies widely by national origin group and place of birth. One- fifth of native-born Latinos lack coverage, compared with a quarter of foreign-born Latinos who have naturalized, and nearly 55 percent of foreign-born Latinos who do not have U.S. citizenship. Low rates of insurance among Latinos may contribute to the fact that Hispanics are less likely than whites to use health services for preventive care. Across a broad range of health status indicators, foreign-born Latinos are in better health than their native-born counterparts. This is a paradox because, generally, low-income households have poorer health. As Latino immigrants acculturate to American society, they adopt the diet and behavior patterns of mainstream culture, including decreased fiber consumption and increased use of alcohol and cigarettes. And a growing proportion of U.S.-born Latinos are forsaking the protective health behaviors of the immigrant generation. This pattern suggests that the health status of the Latino population may decline in the future.